This dish is very high in protein. 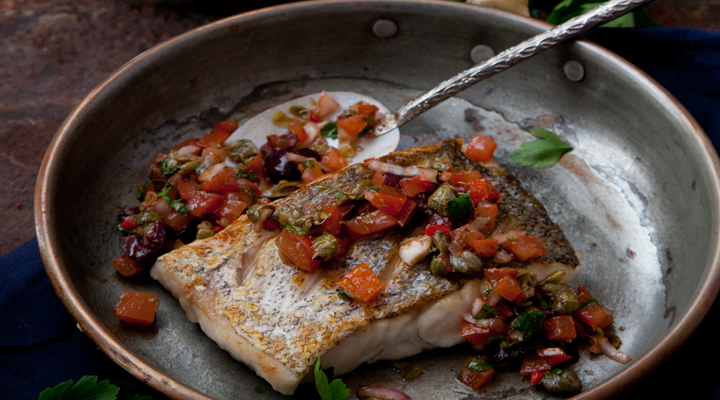 The homemade salsa adds a fun flavour to the hake dish. 1. To make the salsa, warm the 70ml of olive oil in a saucepan set over a medium-low heat. Add the onion, garlic and chilli flakes and cook for 1–2 minutes, until softened, but don’t allow them to fry or colour. Add the tomatoes, capers, olives and tomato purée. Turn down the heat and allow the flavours to infuse without cooking the tomatoes. Add the parsley and salt to taste. Add a splash of balsamic vinegar and a splash of warm water if it’s too thick. Remove from the heat and set aside. 2. Cook the potatoes in boiling salted water until they are cooked through and tender. Drain the potatoes well and put them back in the pot. Make a creamy mash by mashing through the butter and warm milk. Season well with salt and white pepper. 3. Trim off any untidy bits on the fish and check for bones, then using a sharp knife, cut into 6 fillets. Turn skin side up and make two or three diagonal slashes in the skin, then season with salt and pepper. 4. Heat 2 tablespoons of olive oil in a large pan set over a medium heat. Place the fish in the pan, skin side down, and fry for 2 to 3 minutes, depending on how thick it is. Carefully turn over and cook for 1 minute more, until the fish is cooked through. 5. Serve the fish on warmed plates with a good spoonful of mashed potatoes and the warm salsa drizzled over.